Diwali Wishes Messages : Diwali is the biggest festival for the Hindus. It is the celebration of light. In other words, Diwali is the celebration of the victory of light over the darkness. It’s the victory of good over evil. Hindu people, all over the world celebrate this beautiful night by lighting up candles and doing a lot of fireworks. The sky becomes so bright with thousands of fire rockets. This night is so colorful as everyone decorates their houses and neighborhoods with Diyas and Rangolis. 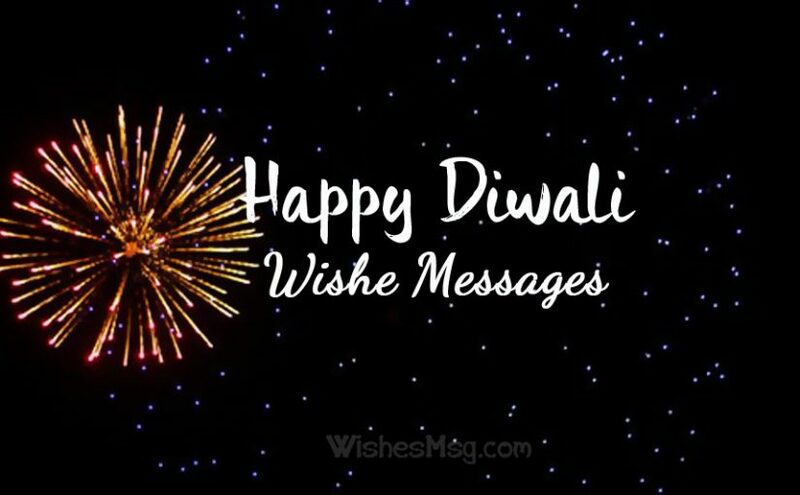 You should make a Diwali wish for your friends, family members, relatives or someone special by sending as a text or in a Diwali greeting card message. The joyous celebration of this divine festival will be multiplied if beautiful Diwali messages or wishes greetings are shared. Let the celebration of this Diwali bring endless joy to your life. May you have a wonderful year ahead full of new success and achievements! May the light of million fireworks enlighten your way for the rest of your life. Light up the candles and let the divine celebration begin! Let the colors of this holy night decorate your life with peace, prosperity and success. I wish you an unforgettable Diwali this year! May the brightness of Diyas enlighten your world with endless hopes and inspiration. May this Diwali bring good health and good times for you and your family! Let yourself be seeped away by the joy this divine festival has brought once again. Forget your problems for they will vanish before the happiness of this Diwali! Light up your world with the brightness of a thousand Diyas. Be overwhelmed by the eternal blessings this Diwali has brought for all of us! 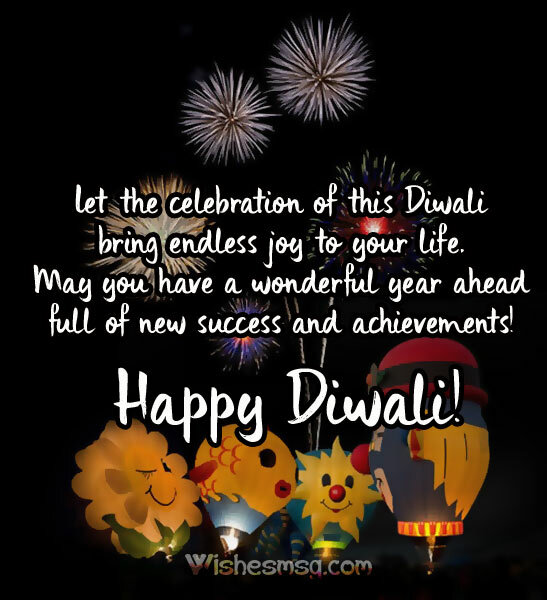 I wish this Diwali be full of fun and good memories for you. May this divine occasion sweeten your life just like you have sweetened my life with your beautiful presence. 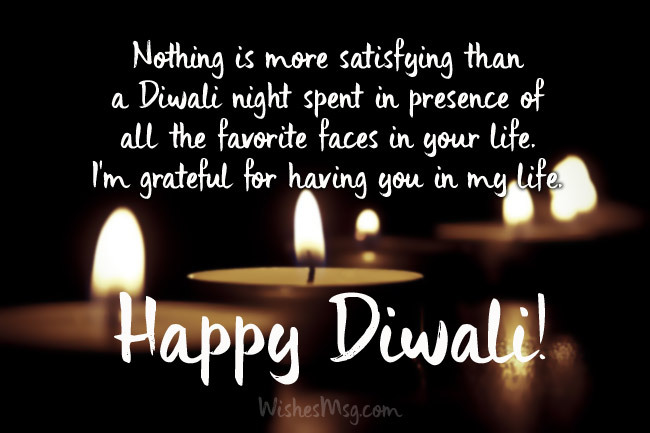 This wonderful night of Diwali has become more elegant because you are in my life. May the divine power grant us many more Diwali to light the candles together! 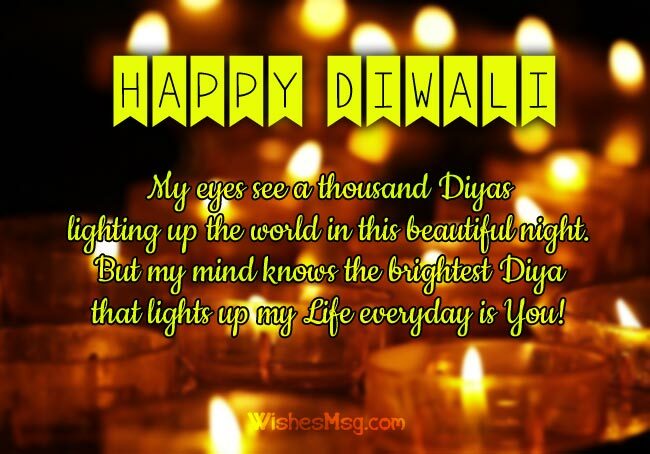 Diyas, Sweets and you are the perfect combination of a wonderful Diwali for me. I hope you having a good time. I am thinking of you in this Diwali! My eyes see a thousand Diyas lighting up the world in this beautiful night. But my mind knows the brightest Diya that lights up my life every day is you! This joyous celebration of Deepavali is incomplete without wishing you a colorful celebration at first. May this divine joy equally touch the most beautiful soul I have ever known! May the divine beauty of this night overwhelm your life with love, happiness and bliss. May this Diwali be the beginning of a wonderful year ahead in your life! Let the sounds of fireworks make this night sleepless for our neighbors. 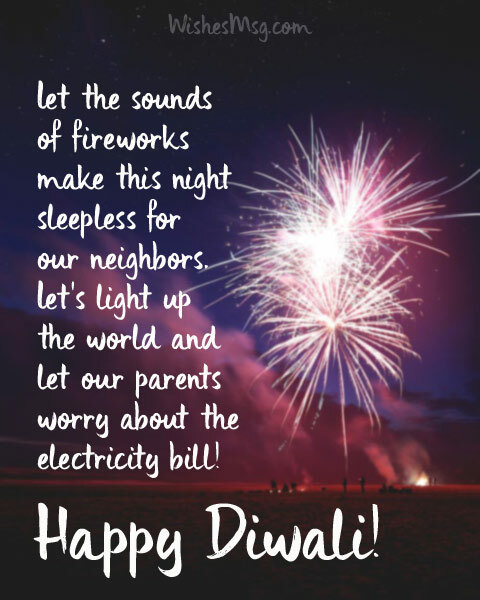 Let’s light up the world and let our parents worry about the electricity bill! I wish you a wonderful Diwali this year. Be prepared to empty your pocket because the children gang is coming to ask money for fireworks. A thousand candles may light up your world this night but they won’t light up your stupid self. The sooner you realize this truth, the better. Happy Diwali! In this Diwali, eat as much sweet as you can but don’t forget to brush your teeth twice a day! And of course, don’t get yourself a diabetic! I wish you will earn more money from the elders than the money you have to give away to the youngers for buying fireworks. Have a good time! Finally, the night has come when you can do nonsense all night long and disrupt everyone’s sleep but no one will a say a word for this. Diwali is great. Wishing a happy Diwali for every member of my wonderful family. May God keep us bonded together under one roof forever. May she keep us all happy! Nothing is more satisfying than a Diwali night spent in presence of all the favorite faces in your life. I’m grateful for having you in my life. Happy Diwali! Diwali is the most wonderful occasion for reuniting with the closed one in life. Every Diwali is an occasion for making new memories with you all! May the happiness of this beautiful holy night remain the same for the rest of the year. May all of us become blessed by the divine power of God! May this Diwali bring prosperity, wealth and success for each one of our family. Wishing you all a great time in this holy night. Happy Diwali! I feel thankful for belonging in such an amazing family. You have made every Diwali in my life a special one. Let’s make this one special for you too! Double the joy of this holy festival by sending beautiful Diwali messages and wishes to your family, friends and special ones. Also, these are the perfect wording to use as Diwali messages in English for corporate and Diwali greeting card messages. It doesn’t matter who you are and what religion you belong to, your wishes matter a lot to your loved ones.